Spain need a point from the last round clash with the already eliminated Morocco side in order to progress to the knockout stage. Even though they come into the match as clear favourites, La Furia Roja will have to work hard in order to grab the result against a challenging opposition. Morocco were unlucky to lose to Iran and Portugal having been the better side on the pitch in both of these affairs. They lost all hopes of progression from the Group B after such failures and only play for pride against Spain. La Furia Roja somehow managed to see off Iran in the second round in spite of producing an uninspiring showing. Fernando Hierro’s Spain has already encountered a number of hurdles at the 2018 World Cup. First the managerial change, then the last-gasp equalizer from Cristiano Ronaldo in the opening fixture against Portugal, and finally a rock-solid defensive line of Iran in what should have been the easiest fixture of the group for La Furia Roja. Spain only won thanks to a fortuitous goal from Diego Costa early in the second half as the Iranian defensive line significantly challenged Hierro’s side creation in the final third. The Asian hopefuls even marked a leveller through one of their most notable figures Saeid Ezatolahi, but the goal was disallowed through the VAR technology assistance for an offside. As much as Spain were lucky to come on top in the evening fixture, Morocco weren’t to take capitalize on a much better performance against favourites Portugal in the afternoon. The European champions ended up winning 1-0 thanks to the early fourth-minute goal from their star man Cristiano Ronaldo. The Atlas Lions showed a great determination to bounce back from conceding a header in a careless manner creating semi-dozen chances in front of Rui Patricio’s goal, but Sporting Lisbon keeper was just too good on the day. Fernando Hierro shifted from 4-3-3 to 4-1-4-1 in the second game against Iran. Dani Carvajal made the return on the full-back replacing his Real Madrid teammate Nacho there. We expect the fully-recovered Carvajal to start the clash with Morocco as well. Elsewhere, it was only Lucas Vazquez who replaced Koke in the centre of the park. 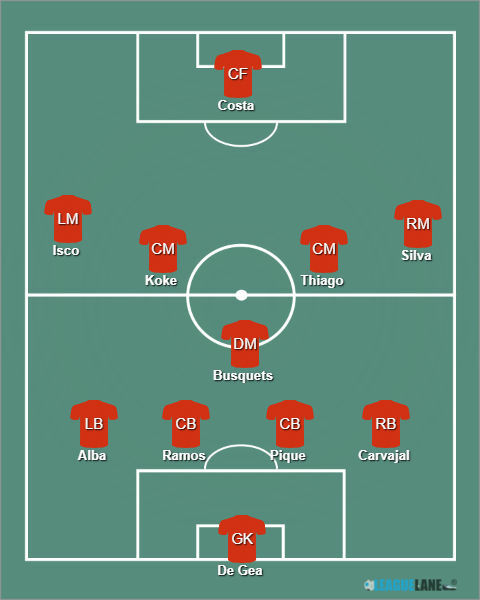 Koke could make the return here, while we also expect Thiago Alcantara to start his first game at World Cup instead of Andres Iniesta who could be rested for the knockout stage here. Diego Costa will lead the line after scoring his third goal of the campaign. Herve Renard fancies the 4-2-3-1 formation with which he is expected to close the competition on Monday. The only change to the squad was the introduction of Nabil Dirar instead of Amine Harit. Nordin Amrabat was moved forward to play on the right-wing letting Dirar take his place at the full-back. While Hakim Ziyech moved on to the left instead of Harit who disappointed in the opener against Iran. 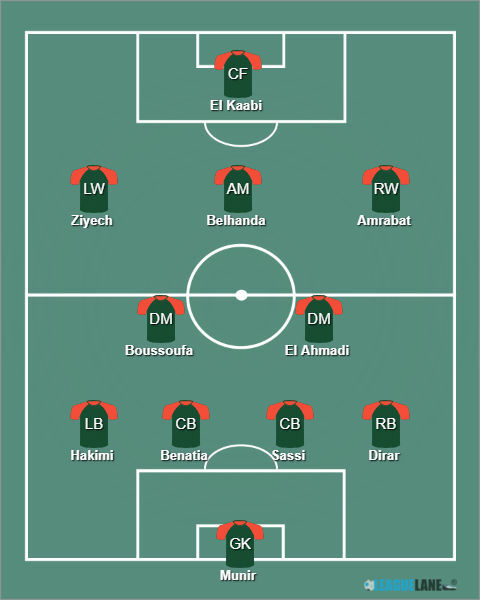 Munir – Dirar, Benatia, Saiss, Hakimi – El Ahmadi, Boussoufa – Amrabat, Belhanda, Ziyech – El Kaabi. 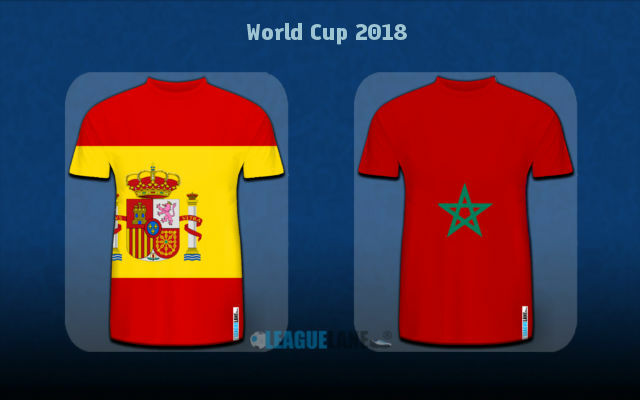 Moroccans will have the chance to enjoy the occasion of playing Spain for the first time ever at the big stage competition on Monday evening in Kaliningrad. The head coach Herve Renard will face hard times motivating his men for the last round tie knowing that the Atlas Lions have already lost all hopes of making it to the knockout stage. Nevertheless, a result against Spain would still be a massive success for the African outfit who well deserved much more than two narrow losses here in Russia. Spanish defensive line, consisted of Gerard Pique and Sergio Ramos, clearly lacks the meticulousness and Morocco could well get a chance to score their first goal in the tournament against La Furia Roja. The Atlas Lions were just unlucky to convert against Iran and Portugal each. They are pressure free against one of the main contenders for the crown and we’d not be surprised at all to see them on the scoresheet. Overall, Spain could easily face serious troubles breaking Morocco down on the day and we certainly do not expect a one-way street for the European hopefuls here. The main bet will be Morocco not to lose by two or more goals at the odds of 1.85. Braver tipsters can try with the BTTS option at 2.20. Predicted Full-Time Result is a tough and narrow 2-1 victory for La Furia Roja. Morocco +1.5 handicap @ 1.85. Correct FT Score: 2-1 Spain @ 9.00.